Just last week we sadly learned that Fox Sports 1’s oddball show Crowd Goes Wild is ending its run on May 8. 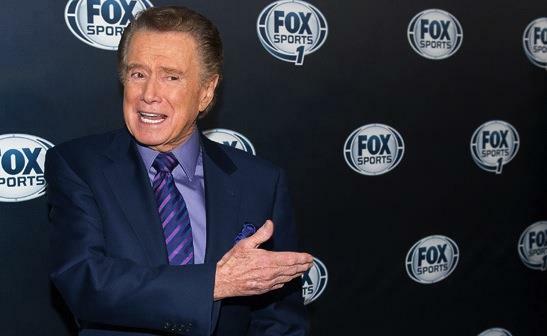 But just to give its fans a nice sending off, they had Regis Philbin throw pies into the faces of Katie Nolan and Peter Schrager if they spelled a former NFL Draft pick’s name incorrectly. CGW has done this before with Winter Olympics names, but pies in the face never get old, no matter the venue. Thus, NF-Spell: Pie Edition is born. The names – Osi Umenyiora, Ben Roethlisberger, Nnamdi Asomugha and Ndamukong Suh – were difficult, resulting in a tie and both Nolan and Schrager being pied twice. CGW may not have lasted very long, but it was an enjoyable experiment that had glimpses of greatness. Nolan, Georgie Thompson, Trevor Pryce and the talented cast should find other footing with the network. Hopefully, Fox will take what worked on the show (like this segment) and start again with something new. Something that still involves segments like this to temporarily free us from sports shouting.